A magician competes in an international magic competition where he goes head to head with a female street magician he has fallen in love with. Desperate Acts of Magic release date was Friday, May 3, 2013. This was a New York release. Friday, May 10, 2013. This was a Los Angeles release. 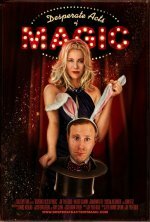 Bored with his life as a computer programmer, Jason (Joe Tyler Gold) dreams of becoming a professional magician.Stacy (Valerie Dillman) achieved that dream, only to be spit out by the male-dominated magic establishment, leaving her to fend for herself on the street, passing the hat to tourists and picking pockets. They both have something to prove. The Brotherhood of Magicians Competition gives them one last shot at success. But as the sparks fly between them, will Stacy pull Jason into her life of crime?